Disturbingly, people are sharing fake pictures during and after catastrophic events, all for the sake of a bit of attention on social media. Hurricane Harvey has brought devastation to many families across the city of Houston, Texas, leaving deep and dangerous flooding in its wake. According to The Washington Post, the storm, the most extreme to hit the city in 50 years, has claimed the lives of five individuals. Despite these tragedies, certain individuals are dramatising the traumatic effects of Hurricane Harvey for the sake of a few retweets. 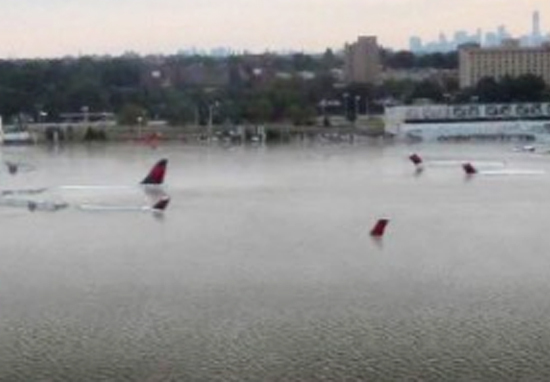 One doctored photo shows Houston Airport completely engulfed by floodwater, the tops of the aeroplanes barely visible. Now, the flooding has reportedly submerged cars up to their handles, but the depth is nowhere near as severe as shown in the photoshopped image. To suggest so is insensitive and unhelpful during what is already a terrifying time for many people. Another, bizarre yet predictable, image which has been widely shared shows a shark swimming alongside a vehicle on a Houston freeway. This image was quickly debunked, known to be an old picture which has been used numerous times. Perhaps the most harmful and offensive picture being shared is of a ransacked shop, openly suggesting some people have used Hurricane Harvey as a chance to commit crime. Again, this is a very old picture and bears no connection to the recent natural disaster which has ripped apart many lives. These false images appear especially sad following footage of a local news reporter saving a flood victim’s life live on TV. Branid Smith was in the field reporting on the devastating effects of the Category 4 storm and torrential rain in Houston, Texas, for KHOU when her cameraman spotted a truck driver in distress. In an age where such images can be created easily and shared quickly, it’s up to all of us to think critically about what we are seeing before spreading false and potentially hurtful information.